Peru's Garcia Gives Asylum to Bolivian Ministers -- Bolivia's Morales Calls Garcia "Vulgar"
In the past Bolivian President Evo Morales has called Peru President Alan Garcia "fat" and "hardly anti-imperialist," but Morales upped the war of words against Garcia on Sunday, calling his Peruvian counterpart "vulgar" for making the "mistake" of giving asylum to a former Bolivian Cabinet minister. EL ALTO, BOLIVIA – Bolivian President Evo Morales on Sunday called his Peruvian counterpart, Alan Garcia, "vulgar" for making the "mistake" of giving asylum to a former Bolivian Cabinet minister indicted for civilian deaths resulting from military repression of protests six years ago during the government of Gonzalo Sanchez de Lozada. Earlier in the day, Morales had said that it was a "very serious" matter that Peru was granting asylum to former Cabinet ministers of Sanchez de Lozada, and he warned Garcia that his obligation is to expel them so that they may be prosecuted in Bolivia. "If the Peruvian government grants asylum or refuge, it would be committing a serious crime, because we've reviewed the regulations of the Peruvian state and they cannot (give asylum) to people who have committed crimes against humanity and who are indicted," Morales said. "To my vulgar comrade Alan Garcia. Fellow president, I want to tell you that you have no reason to protect criminals in the Peruvian state," said Morales, going on to recall that a Peruvian Cabinet minister had called him "vulgar" some time back in reference to another matter. "One of Alan Garcia's ministers called me vulgar. I don't know what he was talking about, but I know it's an insult. It doesn't bother me. But now, since he's making a mistake by not even respecting Peru's regulations, I'm saying: vulgar comrade Alan Garcia, I'm asking you with great respect to expel these criminals who are escaping to Peru," Morales said. The Bolivian president was alluding to remarks by Peruvian Education Minister Jose Chang, who used the term to describe him late in March, according to local media reports. In a Sunday ceremony to present homes to certain citizens in the city of El Alto, Morales asked the Peruvian government "not to offend" the Bolivian people by committing a "mistake" and granting asylum to the ex-officials. He said that Garcia "has the obligation" to expel the former Bolivian ministers, and he warned him that he would be making a mistake if "he doesn't even respect (Peru's) regulations." Peru granted asylum to one of Sanchez de Lozada's ex-ministers – Jose Torres Obleas – and is considering whether or not to do the same for two other former officials from that administration. 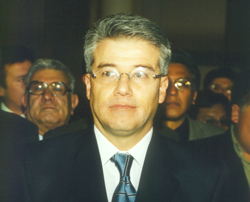 Sanchez de Lozada, who was president from 1993 to 1997 and again from 2002 to 2003, and several of the ministers from his second administration stand accused by prosecutors of "genocide" for the 60 deaths caused by the military's suppression of a series of social protests in the city of El Alto in October 2003. The then-president resigned on Oct. 17 of that year and traveled to the United States, where he now lives, and where his former ministers of defense and energy, Carlos Sanchez and Jorge Berindoague, respectively, also reside. Sanchez de Lozada's other ministers who are living abroad include Torres Obleas, Javier Torres Goitia and Mirtha Quevedo, who are in Peru, as well as Yerko Kukov, Guido Añez and Hugo Carvajal. 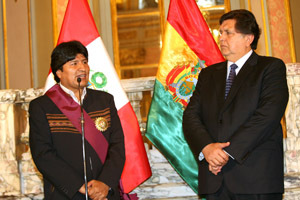 Last year, relations between Peru and Bolivia were marked by tension after several verbal jousts between the presidents. On one of those occasions, Morales called Garcia "fat" and "hardly anti-imperialist." Peru also this month gave political asylum to Venezuelan Opposition Leader Manuel Rosales, who challenged Venezuela President Hugo Chavez for the Presidency. Venezuela withdrew its ambassador to Peru as a result.